Curtis and Sarah Millsap, along with their children and several apprentices, are in their eighth year of operating Millsap Farms, a 20-acre diversified farm in Springfield Missouri. They grow 2 acres of vegetables, with 12,000 square feet under greenhouses and high tunnels, using organic practices, with about $150,000 per year in sales. They focus on high profit, highly marketable crops, such as head lettuce, carrots, beets, tomatoes, greenhouse cucumbers, bell peppers, salad greens, leeks, garlic, onions, eggplant, etc. The Millsaps sell their produce through a Community Supported Agriculture program which has 100 summer members and 50 winter members, and a vibrant year-round farmers market. They host a weekly pizza night from May to October, feeding 250 people pizza out of their hand-built wood-fired pizza ovens. Curtis is always looking for ways to do more with less, including energy and water conservation measures such as no-till beds, a high thermal mass Chinese-style greenhouse, rainwater catchment for greenhouse irrigation, and solar water heating. Additionally, the Millsaps have experimented with different scales, having grown up to 7 acres of vegetables in their biggest two years, before finding that they were more profitable and productive at 2 acres. Millsap Farm is a teaching farm, hosting several full-time apprentices, part-time interns, and lots of volunteers each year. Currently there are two apprentices living on farm, which is part of the Millsap's commitment to growing sustainable agriculture in the Ozarks region. Millsap Farm is a founding farm of OzarksCRAFT, a farm training cooperative which helps non-farmers get the experience and knowledge they need to become farmers. As of the end Summer 2015, they've hosted 25 apprentices, 15 of whom are still involved in agriculture full time, 4 of whom now have their own farms. Curtis has been a full-time farmer for almost 8 years; before that he taught school and was a general contractor. He loves to teach and learn, visiting other farmers with his crew of apprentices to collect and share new and old ideas, while lending a helping hand. He speaks regularly at state and regional conferences, sharing about innovations on the farm such as the Chinese Greenhouse, season extension, and strategies for developing a resilient farming enterprise. Because of Millsap Farm's proximity to Springfield, just 4 miles north of town, it is a popular stop on farm tours, hosting hundreds of visitors each year, from Missouri Organic Association groups to Winter Growing Workshops, to Missouri State University horticulture classes, or just impromptu visits by farmers who are in the area, and want to check it out. The Millsaps see themselves as part of a vibrant community of growers in the southwest Missouri and northwest Arkansas region, who share ideas, best practices, and experiences, regarding conservation, production, and marketing. I’ve presented to a college horticulture class of about 28, both in the classroom and later when they came to the farm for a tour. I’ve hosted dozens of farmers this year for individual tours of our farm. We also host a weekly tour of the farm as part of our pizza night tours, which are usually groups of between 10 and 40, often with a farmer or two in the group. These tours happen every Thursday evening from May to October. We hosted a congressional agriculture tour on October 6, and another college class at the end of October. In summer 2018, we hosted a group of high school Ag Educators from the region. It was a busload of about 40. I always highlight the modifications that we have made, and are making to the packshed. I point out that as this is where we spend 1/2 of our time and energy of vegetable production, it’s really important to focus on efficiency and ergonomics. Specifically, we look at the efforts we have made to get all our produce handling onto wheels, by employing lots of push hand trucks, and the innovations we’ve made to where and how we wash our produce. So far, we have learned that an efficient packshed is a much happier and healthier place to work. We’ve added space, concrete, wheels, four different washing setups, and new coolers to our packshed during the timespan of this grant. Our root washing time has been dramatically reduced and is using at least 75% less water, due to switching to a pressure washer. After consulting with David Hambleton by phone, he advised that Kranzle was the powerwasher we wanted. 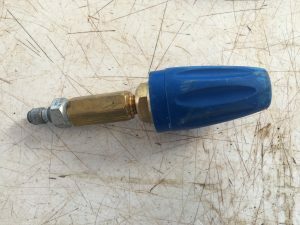 It has the capacity to run without being sprayed and without ruining the pump. 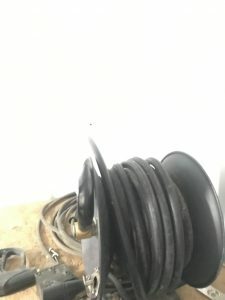 Other pressure washers destroy their pumps when they are left running but not moving the water through. Kranzle is the only brand that has this feature. We are very pleased with it; it works great, is very quiet, and has plenty of power. We needed several adapters to make the pressure washer work within our wash and packshed system. So far, we have several tips and extensions which we are using to wash root vegetables, totes, and the packshed. We have several more ideas, but have not purchased and implemented them yet. 2018 update; we have found that the pressure washer is one of those tools that, once you have one, you find all kinds of uses for. In general, it’s just tremendously useful for cleaning everything. 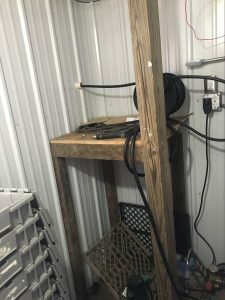 We have ours situated permanently in a heated room at the packshed, with a pass through in the wall for the hose, so we can pull the hose off the reel, turn on the pressure washer, and be cleaning, in about a minute, and we can return it to storage in about the same amount of time. 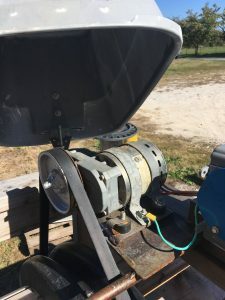 The pressure washer reel allows us to pull out and wind up the pressure washer hose in moments. By permanently mounting the pressure washer reel, hose, and pressure washer, we can easily turn it on and use it, with minimal set-up time. 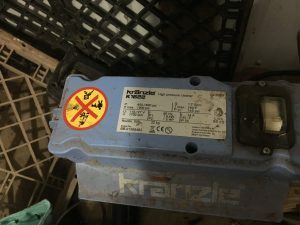 Kranzle pressure washer was the perfect pressure washer for us, particularly because it doesn’t self destruct when left on without pressure washer use. 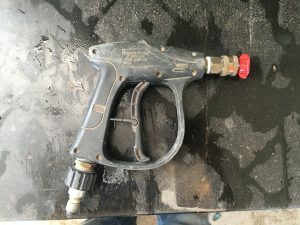 this pistolgrip sprayer is the perfect end sprayer for cleaning carrots, totes, and other close up work. The quick release allows tips to be easily swapped. 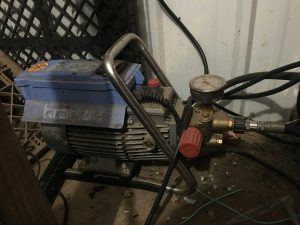 This pressure washer head is excellent for washing totes, floors, and crates. 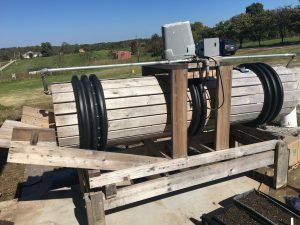 We built, with assistance from our neighbor Avery Broyles, a barrel root washer, which revolutionized carrot and beet washing on the farm. Tasks which used to take hours to accomplish, like washing hundreds of pounds of carrots, now take 20 minutes. 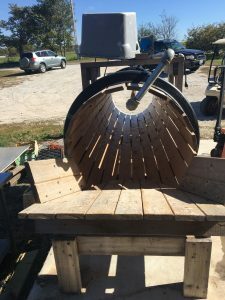 We still use the pressure washer for anything bunched, and for lots of other tasks, but we have found that we save so much time and effort using our barrel washer, that we are almost always topping carrots and making more money that way, based on the time and effort savings. 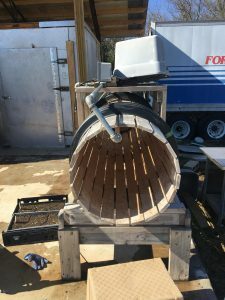 Barrel made from pine 1×3’s with 24″ plastic culvert for rings. Root washer is 8′ long, with caster wheels for rollers. Galvanized pipe with holes drilled in it spray water on the roots as they rotate, and the clean roots are dumped into a crate at the outlet. Gear motor to drive root washer. 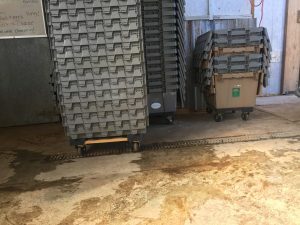 The biggest change to materials handling in the packshed, which has also bled over into other areas of the farm, is the emphasis on everything going onto wheels. We now have 6 four-wheeled platform dollies in the packshed, so once we bring produce to the packshed, we are rarely carrying full crates around. Instead we are using these very reasonably priced platform dollies, some from Harbor Freight, and one from Amazon, to easily glide around the concrete floor. We insulated the floor of the walk-in cooler, and so we had a 2 inch step up into the cooler, but we built a ramp to smooth the transition. Now, when we go to pull 1,500 lbs of produce to go to market or to set up a CSA pickup, we have it already stacked on these dollies, and can wheel it out to the trailer or into the farmstand without ever lifting a crate. These cheap utility carts from harbor freight have found dozens of uses in our packshed and greenhouse. We like this system so much that it has become a guiding principle in our ongoing renovations to our packshed, and to the rest of the greenhouse complex; we’ve poured three different concrete slabs outside of our existing workspace to have space to stage, store, and use bulky and heavy items like soil mix, firewood, and compost. We’ve also eliminated obstacles to rolling carts and dollies around, like hoses, cords, etc. Now instead of carrying these items around we can palletize them, and move them with a pallet jack or platform dolly. 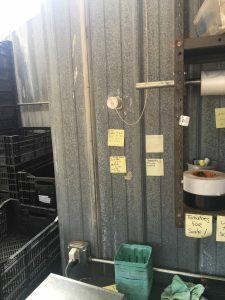 These changes, which were not very expensive when looked at over time, have saved us thousands of pounds of lifting per harvest day/ or day of work in the greenhouse. We purchased and modified a hand pallet truck, which we use with our mini-pallets. 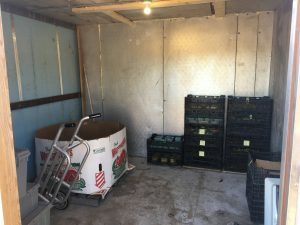 We have also added two additional coolers, one for cold long-term storage of carrots, beets, onions and garlic, and one for warmer storage of tomatoes, eggplant, and cucumbers in the summer, and winter squash and sweet potatoes in the winter. Two new cooler spaces, with poultry barn trusses as a lean-to roof. 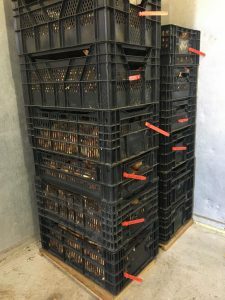 Bulb crates, which can sometimes be had for very little from nurseries, are great for storing dry products, like garlic and onions. After years of Coolbot use, we purchased and set up a professional cooling unit for our new walk-in. We’re hoping for much longer lifespan out of this unit than what we’re getting from window a.c. units and coolbots. Bulb crates with tomatoes on mini pallets, in the 55 degree room. We built the new cooler with storing large quantities of winter squash and sweet potatoes in mind. A 4′ door allows us to wheel full pallets of winter squash and sweet potatoes into the cooler. The lessons we’ve learned, even with the modest changes we’ve made, such as streamlining our process, and putting more things on wheels, have saved us hours of labor to date. Perhaps even more important, we’ve established a culture of continuous improvement, where we try to empower everyone to look for and enact or suggest changes that might improve our workspace. When designing this project, we underestimated the difficulty in determining energy savings year to year. This difficulty primarily arises from three factors; we expanded the cooler by 50% when we added floor insulation and a strip door, and the two summers we are comparing were quite a bit different temperature-wise (July of 2016 was about 5-10 degrees cooler than July of 2017), and we irrigated quite a bit more this summer than last (the well is on the same meter). That said, we were still able to see a significant decrease, over a twelve-day period of similar weather from July 9-21 of 2016 and 2017. In that twelve day period of 2016 we used 1,760kwh, while in the same, slightly warmer, twelve days in 2017, we used 1,560kwh. This is a 9% decrease, which, if it stays consistent over the year, would save us about $25/month, paying the improvements off in about 18 months. It’s also important to note that we are cooling 50% more space, due to the cooler expansion, and we are now able to consistently keep the temperatures in the mid thirties, rather than the forties, which means our efficiency has increase dramatically. The addition of insulation to the floor, and stripdoor to our walk-in cooler has dramatically improved it’s ability to cool and maintain cold temps. As a result, we are seeing a lot less spoilage, especially of the long-term storage crops like onions and garlic, which really don’t appreciate the ups and downs. It’s impossible for us to quantify this improvement, but the benefit will surely be evident to any market grower. Less spoilage and higher quality produce are key to greater profitability. 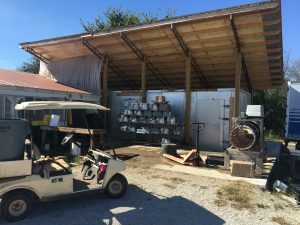 As our farmstand assessment and improvement came along, several things became apparent; one was that we did not have enough cold storage space, partially due to increased productivity on our 2 acres, and partly due to growing more cut flowers, which really needed more storage space. 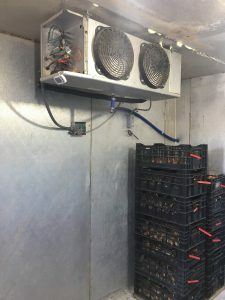 As a result, rather than simply renovating our existing cooler (we did this in 2016), we added a new larger cooler 22×11 feet, with a commercial refrigeration unit, and the ability to split the cooler into two spaces, one at 33 degrees, and the other at 55. 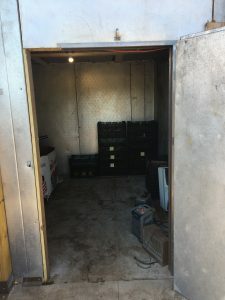 With the addition of two new spaces to our existing 38degree cooler, we now have a great long-term storage option for cold storage items (beets, carrots, onions, garlic, etc.) and a good warmer storage space for tomatoes, cucumbers, and eggplant in the summer, and sweet potatoes and winter squash in the winter. Both of these spaces are built on an insulated slab, and have a zero elevation entrance, so we can freely wheel large loads into and out of them. 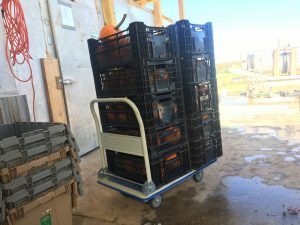 The warmer side also has a 4′ door, which allows us to use pallet jacks to move entire totes of winter squash and sweet potatoes in and out of the room. 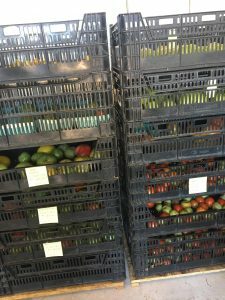 Altogether this has meant much better outcomes for our storage, and much better use of our time, as the open floorspace in the storage coolers allow for easy, efficient sorting and moving of produce, minimizing our wasted time and vegetables. The second thing we realized as we created more space in the wash and pack area was that we could really move a lot more product in a lot less time with two wheeled dollys. So the addition of two dollys, one with the ability to tilt (so we can keep the load near vertical), has made a big difference in our ability to move large amounts of produce through the space without stressing our backs or taking extra steps. See the videos and photos to understand how this system works for us.